For example, here is Matthew Burns and Laura Leslie’s article in WRAL, “Cooper tells Congress to step up in climate change fight.” It was the Cooper administration’s leading item in its press release about the governor’s appearance. So our governor told Congress to step up. OK. Step up how? He cited his executive order last fall that North Carolina slash its greenhouse-gas emissions by 40 percent by 2025 and his decision two years ago to support the Paris climate accord. What would that executive order do? On that, the reporters merely recite the official takeaway. How would the governor accomplish these things? By incentives for certain goods and choices, expensive infrastructure build-ups, cronyism, euphemism, and make-work. Does the governor of North Carolina actually believe that incentivizing 80,000 electric vehicles would mitigate hurricanes? Reporters don’t ask. But he at least made it seem that way in introducing his EO. The State of North Carolina occupies an area that amounts to about 27 one-hundred-thousandths (0.00027) of the surface of the Earth. We could cease all productive activity and emissions and still have no impact on the planet. We could all disappear like the Lost Colony, and the global climate wouldn’t change. The idea that we could save the climate by cutting our emissions reductions just a mite faster than we already have been doing for two decades is daft. Wait — cutting emissions faster “than we already have been doing”? What does that mean? Sounds like we’ve been (checks again) cutting emissions already. But that would be major news, right? Well, reporters don’t appear to know that emissions in North Carolina have been falling dramatically. All. Century. Long. Why not? Maybe they don’t really want to know. It would mean recognizing that market choices, not government force, is bringing about the very results that they supposedly want. Oh yeah? Well, what about Paris, then? 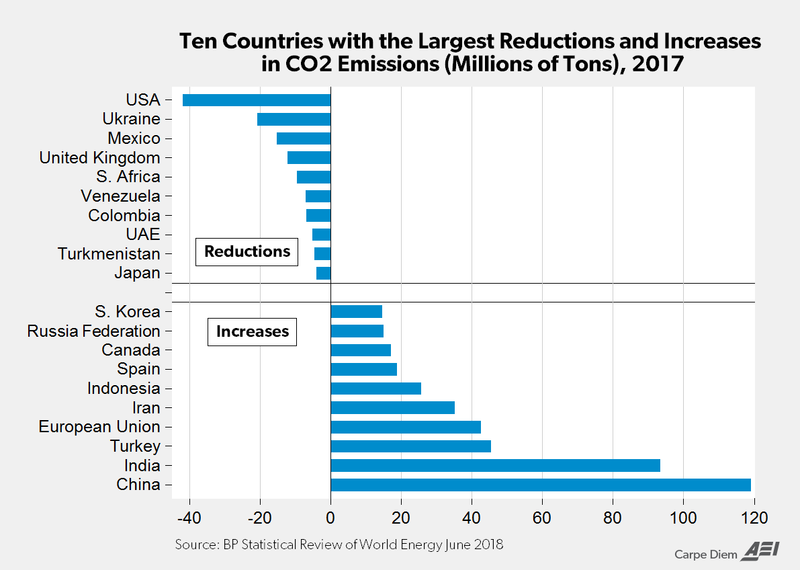 If you demand the Paris accord despite much better, market-based results in the U.S. and the State of North Carolina than all the Paris accord nations, what are you even doing? If you want to know those facts, you have to look elsewhere.